I am going to set up this post abruptly, so here goes: Hey. I have two kids. 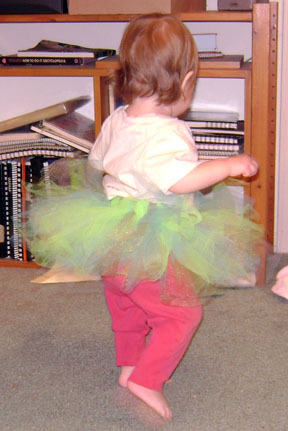 We have been invited to a super girly birthday party, and it requires tutus. The blue/green one was made pretty much following directions with the following color sequencing (blue green blue green blue gold). The red and coral one is much more freeform (*cough* I mean Artistic!). I cut the pieces at an angle, and they are varying lengths. And put in a bit randomly. It's also got some gold, some glittery red. An easy and fun project, though tulle is very static-prone and not the easiest thing to cut evenly. Luckily, it doesn't really matter.